Custom Coils has been designing and manufacturing magnetic components like the switch mode transformer for more than four decades. This transformer design is used extensively in electronic applications, usually within a switch mode power supply. Switch mode transformers come in many different shapes and sizes. Due to the diverse form factors and multitude of applications; we custom design and build our products to meet our customers' specific needs. 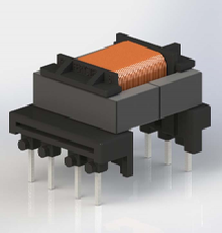 A switch mode transformer (Switcher) is very flexible and can be used in many applications. Switchers are used in a wide variety of industries such as telecommunications, biomedical, and aerospace. In these industries, they make up the bulk of the communication and power application transformers. Other types of switch mode transformer applications include but are not limited to switching power supplies, converters, inverters, and filters. These types of switchers are prevalent in automatic controls, biomedical equipment, geophysical instrumentation, and electronics. A switcher also lends itself to designs that require high switching frequencies often up to 500KHz. 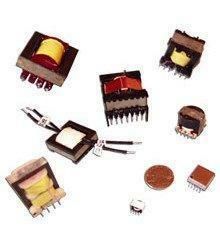 Other types of switch mode transformers are the preferred choice for lower frequency applications. Some of these applications include high Q filters; RFI filters, switching regulators, and low power isolation power supplies. The switch mode transformer is ideal for use in DC/DC converters for industrial controls and all types of test equipment. They work great in various topologies such as push-pull, forward converter, buck/boost, half/full bridge, and flyback. The unlimited number of applications continuously challenges us to come up with creative custom designs that can be economically manufactured and tested. The total power output and the operational frequency drive the overall size and shape of the switch mode transformer. This along with any specific mechanical design requirements specified by the customer help define a core that is "best" for a specific design. Custom designs begin with the core of the transformer. Custom Coils sources it magnetic cores from several key industry-leading magnetic manufacturers. This allows flexibility in design and lowers design costs. Custom Coils' cores are constructed using ferrite, which is pressure molded ceramic structures of various shapes. These cores are made by mixing iron oxides with other oxides or carbonates. Carbonates consist of a recipe of metals such as magnesium, nickel, or zinc. Once the cores are shaped, they are kiln fired and allowed to cool. These cores can then be assembled with the corresponding bobbins to create a switch mode transformer. As with the cores, Custom Coils sources bobbins and coil forms from many of the industry leading bobbin manufacturers. This gives us the flexibility of selecting nylon, glass-filled, flame retardant, or Rynite material bobbins. This also gives us the flexibility to choose between single or multi-section bobbins and between vertical or horizontal core mounting. The bobbins also determine how the transformer interfaces with the rest of the circuit. Custom Coils offers a full line of standard terminated bobbins. 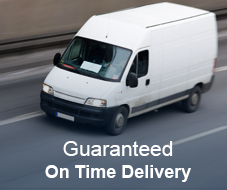 We can also design and develop custom terminals to meet your exact requirements. Most of our bobbins allow attachment to printed circuit boards via PCB pinouts or surface mount. The PCB pinouts offer pin spacing from .150 and .200 typical up to .300 typical. 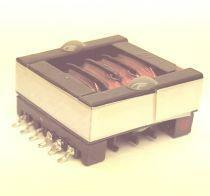 Surface mount headers offer a highly reliable way to pick and place transformers in large volume. The surface mount bobbins offer standard pin pitches of .100 typical. Custom Coils also offers flat solder lugs, quick disconnect terminals, and flying leads. 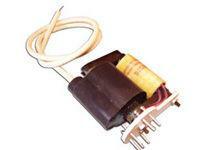 This gives a full complement of attachment possibilities for a switch mode transformer. When building custom magnetics such as a switch mode transformer many different winding procedures are used to build different designs. The bulk of the small to medium size winding is done on one of the various Custom Coils owned winding machines. These winders allow Custom Coils to maximize winding time by winding multiple bobbins at one time on each machine. Custom Coils has a large investment in multi-bobbin winding equipment such as Synthesis S-100's, Essex Leesona 108's, and Elden 605 layer winders. These machines allow us to wind multiple bobbins simultaneously and maximize winding time to keep costs down for switch mode transformer production. Even with all the capital equipment, Custom Coils still does quite a bit of hand winding using many different types of hand winders. This allows us to still satisfy specialty applications with low turns counts and allows us to do small quantities without any large setup fees and times. Although we can build smaller specialized quantities for custom orders we also have the equipment and capabilities to do high volumes at premium quality. Another key element of the switch mode transformer and another key factor when determining winding procedure is the actual wire type to be used. Custom Coils uses many different types of magnetic wire from several key sources. Some applications call for super fine wire (#46AWG) for tight spaces while others need large current carrying capabilities of super heavy build (#10AWG) wire. We also have several insulating possibilities to solve high-temperature applications. We often use triple or quadruple build, twisted magnetic wire and other isolation techniques. We offer the use of different types of sleeving using materials such as Teflon, PVC heat shrink, and vinylglas. This allows isolation and protection where needed and wanted. Custom Coils offers many type of finishing products as well. We provide many types of shielded covers, clamps, and isolation options to finish the packaging of your transformer. All Custom Coils switchers go through a varnishing stage where Ripley's 468-2FC varnish is vacuum impregnated into the transformer. The varnish impregnation increases the resistance between coil wires many times over air. Custom Coils also uses many types of potting and encapsulating compounds such as Ripley's 471-5LL, 3M Scotchcast 280 epoxy varnish, and Dolph's CB1054 potting compound. Other high temp special applications use Hexel 4003. These compounds give Custom Coils a variety of options when finishing and encapsulating a switcher. 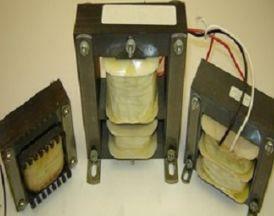 Custom Coils takes pride in the fact that we test 100% of our transformers. Custom Coils uses several Vol-tech 3600 to do all testing required. Custom design test suites are developed based on the customer's requirements and expectations. The Voltech 3600 gives Custom Coils the flexibility to measure inductance, turns ratio's, resistance of coils, leakage, and hi-pot. We use all these type tests for our outgoing tests, random sampling, and TQM initiatives. Custom Coils warehouses many test fixtures of some of our most popular parts. This allows tests to be defined quickly for customers and no tooling costs incurred. Quality is the ultimate goal, through engineering design, manufacturing processes, and quality control over these processes. When you have a need for a switch mode transformer, we're here to help from the initial design right through testing and final delivery. Just contact Custom Coils and we can help out on your projects big and small. 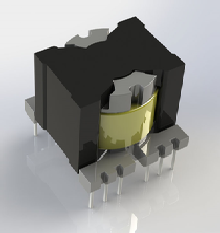 Have a question about a switch mode transformer or any other custom magnetic assembly?